View More In Oil Filter Wrenches. This oil filter wrench fits select Toyota and Lexus vehicles equipped with 2.5L to 5.7L engines which are fitted with cartridge style oil filter housings with a 64mm (2.52") 14 flute cap. 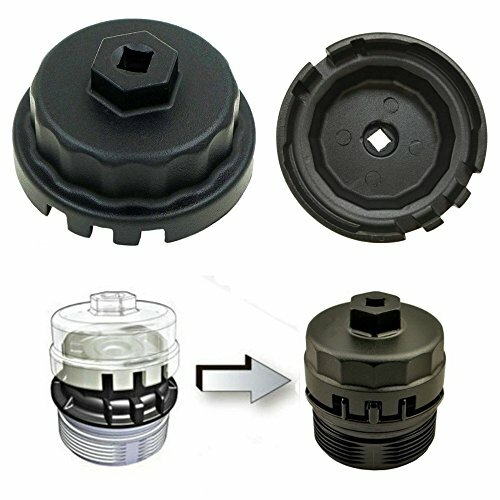 NOTE:It will not fit all years and models and does not fit the 1.8L engine.Please verify the size of your oil filter housing cap before ordering. - This oil filter wrench will not fit traditional disposable spin off oil filters, and is designed only for cartridge style housings with replaceable filter elements. - It snaps onto you 3/8" extension and doesn't require a socket to use it and it won't damage your oil filter housing cap by slipping. - 24mm x 64.5 mm with 14 fultes for a snug no-play, no-slip fit. - Made from high quality aluminum,won't crack like cheaper aluminum or flex and damage the plastic caps like stamped steel versions. Warranty period: 1 Year warranty for normal use,and 24 hours customer service stand by,Have any questions you can contact us. If you have any questions about this product by Bestong, contact us by completing and submitting the form below. If you are looking for a specif part number, please include it with your message.